Reinhard bought Velero (sailboat in Spanish) in August, 1974 at the Old Lyme (CT) Marina in response to an ad in Soundings Magazine. She had a Vire inboard and white topsides. He raced her locally and in Off Soundings for 10 years and then sold her to Steve and Janice Allen of Mystic, CT in April, 1984. 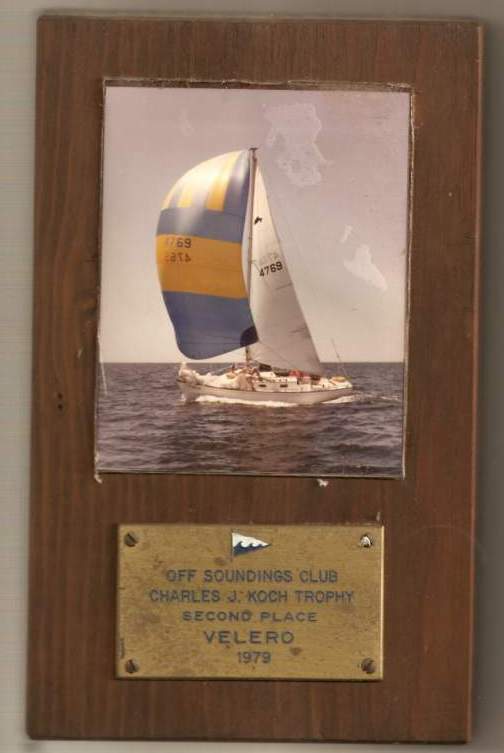 Here she is with her 2nd place trophy in the 1979 Off Soundings Club Charles J Koch Trophy Series. This trophy went to to the top performing boats in the highy competitive Class B-2, 45-50 boat division - boats under 30'. The races were held 'off soundings' in spring and fall weekend series, and prizes were awarded for the best combined results. Dolphins won this class 11 of 16 years between 1965 and 1980. And had a few 2nds too! We had lost track of her but #117 was recently spotted up in New Brunswick, Canada - for sale. Her name is still WHIMBREL. She was recently purchased. Click here to go to her. I came across some more information on my old 1969 Dolphin Velero, Hull #117, which I thought you might be interested in. According to my notes the original owner was David Campbell of Cove Street, Noank, CT. I bought the boat from Atty. Charles Irving in Old Lyme, CT who apparently was the second owner and kept the boat for about 6 months. I bought the boat together with my good friend Lynn Van Campen on August 2, 1974. I bought her share on August 15, 1976. Webmaster Note: April 7, 2008 - your webmaster spoke to Steve Allen who advised he sold Whimbrel in 1987 through a broker in Old Lyme, CT. He recalls being told that the buyer was from Maine.